Independence. It's a word that we in India have taken for granted. We know for a fact that while we sleep soundly, invest in a better life, or maybe even plan a family, someone out there is safeguarding us and our near and dear ones. We don't know their names, or who they are really, and are unaware of the hardships they face. 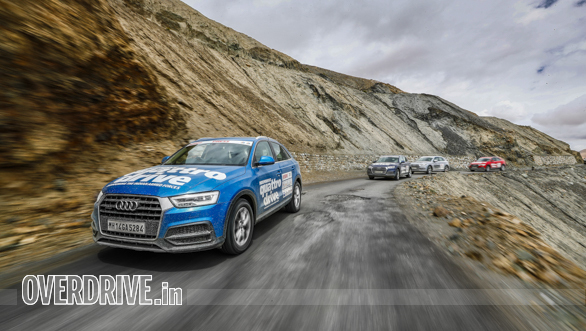 It's to remember and recognise these brave soldiers that the OVERDRIVE Independence Quattro Drive was set in motion. To honour the Indian armed forces; the men and women who've gifted us the most valuable asset known to mankind - freedom. 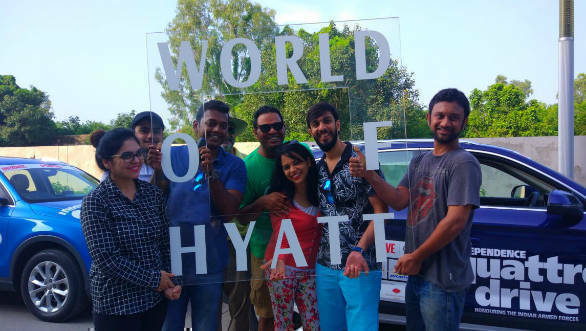 2018 marks the sixth year of the IQD and, as usual, we had a motley bunch of participants gathered at the Hyatt Regency in Chandigarh, our basecamp before embarking on any trip to the mountains. 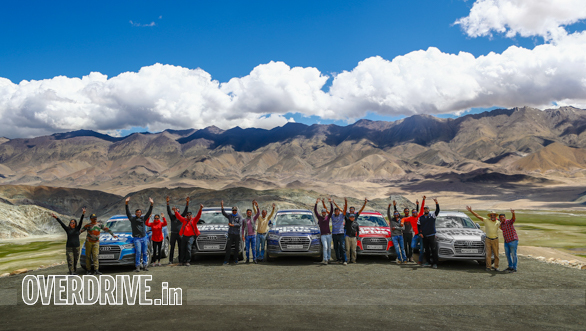 While some were excited about visiting Ladakh, others were elated about this being a road trip of a lifetime. 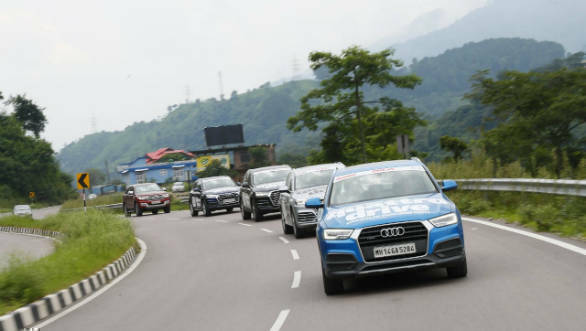 The cherry on top of the proverbial cake was the fleet of Audi SUVs that we'd lined up for them to drive. 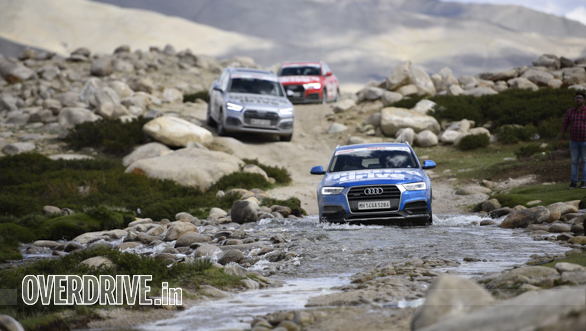 Audi India has been constant with their support for the IQD, since 2013 and joining the Q3 and Q7 this year was the all-new Q5, the finest SUVs in Audi India's stable. 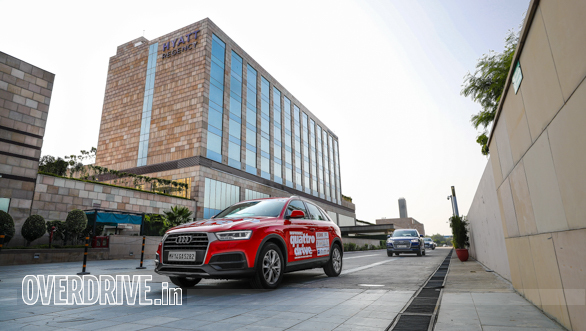 Pradeep Prakash and his wife Swathi Nayak, both avid driving enthusiasts from Bengaluru couldn't contain their excitement as we rolled out of the Hyatt Regency. They were joined by their friends Nagarjun Prasad and Suhas Kulkarni, who for the rest of the journey would squabble for the driver's seat! Completing the list of participants driving up from Chandigarh was Mridul Mittal, a young businessman from Pathankot, Punjab with quite the affinity for the throttle pedal. 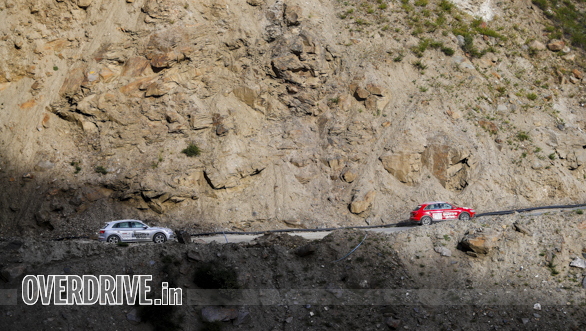 The drive from Chandigarh to Manali was covered quickly with smooth tarmac aiding progress almost throughout the whole section. Along the way, the participants got a taste of what it is like to drive these tech-laden SUVs. 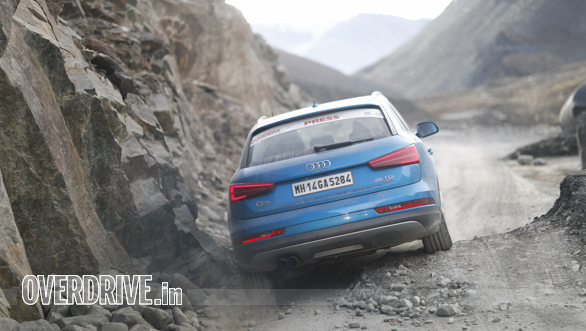 Many were in awe of the grip levels that Audi's famed Quattro four wheel drive system offered. 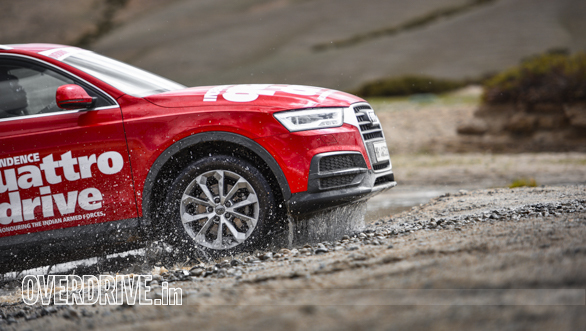 "Wow, I cannot believe how much power and control this Q5 petrol offers," said a beaming Swathi. Ladakh is a region that faces water scarcity and that makes using the precious water supply to wash cars, almost criminal. 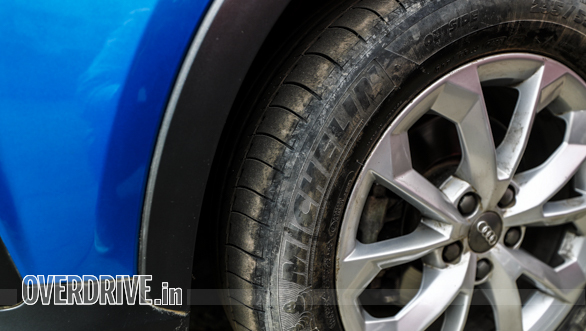 But we at OVERDRIVE love to give our cars some TLC, especially after a long, hard day in the dust and grime. 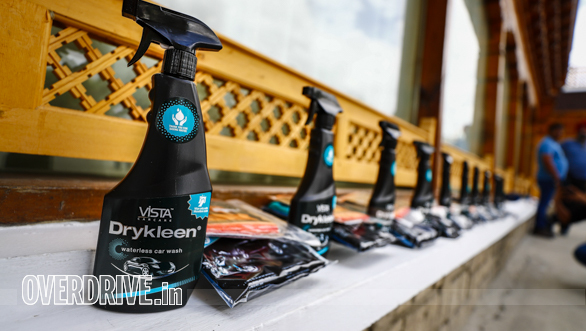 Vista Car Care's new Drykleen is a car washing solution that does not require any water at all. All we had to do was spray the contents of the bottle on the car and use a microfibre cloth, supplied along with it to wipe dirt off the surface. We even held a contest for the cleanest car, which Swathi and Pradeep won. And let's not forget the sparkly, shiny cars! The route from Koksar to Jispa is a driver's delight. 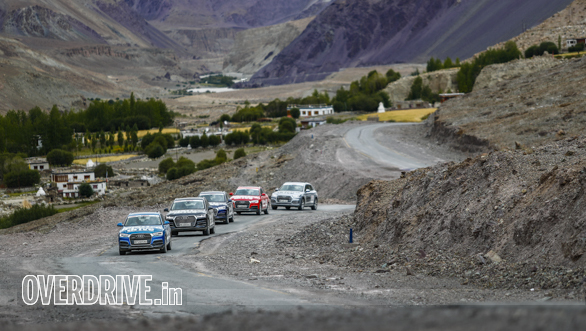 Smooth tarmac, along with flowing corners allowed us to stretch the legs of our Audis. 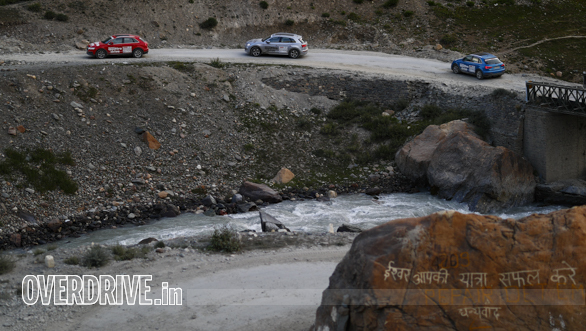 The Manali to Leh highway has been under constant construction and with each passing year, the quality and quantity of the black top improves. That said, the section between Lachulung La and Pang is full of mud and ruts with a thick cloud of dust hanging in the air, kicked up from the car ahead. 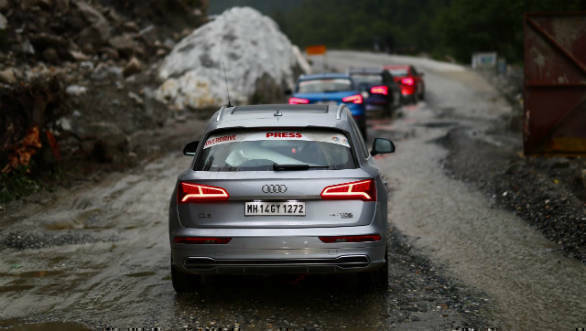 One had to be careful about not choking the air filters of our Audis so we had to insist on keeping a distance, away from the dust cloud of the cars ahead. This is also a good idea in convoys. Big gaps make for smoother driving, more safety and less stress. The cold, arid region and the apparent lack of oxygen had also begun to take a toll on few of the participants. 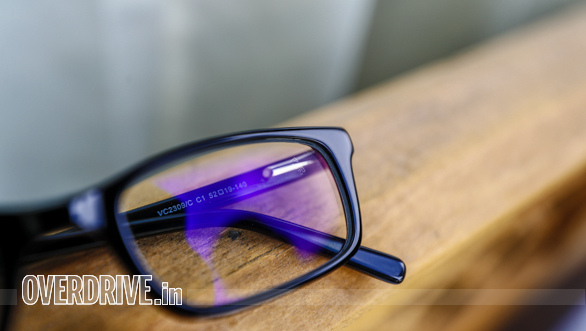 Suhas, for instance, got a headache after stepping out for a only minute, to click a selfie at Tangalang La. Altitude sickness is real and can catch anyone off guard. 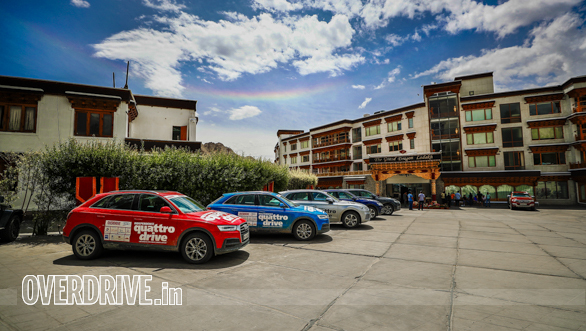 While he managed to recover by the time we got to Leh, Abhishek, the Red FM RJ from Kolkata was caught in the potentially deadly grasp of acute mountain sickness (AMS). 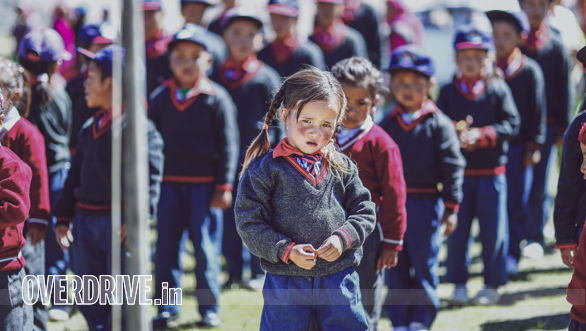 Considering his condition, we had to take a call and leave him behind as we began the second leg of our journey from Leh to Hanle along with the second group of participants who flew into Leh and would drive back to Chandigarh after the Independence Day celebrations. What can we say about the guys from RED FM. Their team is well known for taking on big challenges, especially when they turn the spotlight on the authorities! But few knew that they also have a strong adventurous streak in them. It's what has inspired them to keep alive their association with the Live Life in OVERDRIVE Independence chapter. So while you may assume they spend all their time behind a desk and a microphone, let us assure you all that chatter comes from some very real experiences, at 16,000 feet above sea level! 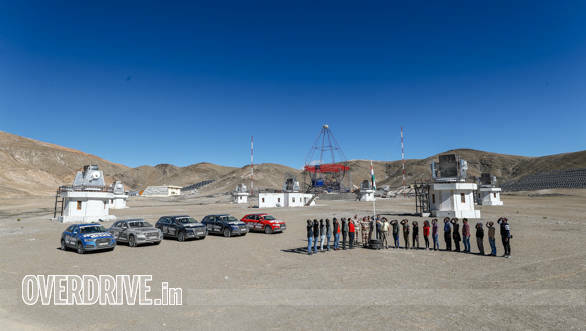 Leh to Hanle, thankfully, is among the least commercialised routes in Ladakh and as a result traffic is sparse with only a few Army convoys thrown into the mix. While the condition of the tarmac is expressway rivaling, what really adds to the driving pleasure are the serene vistas along the route. For as much as 80 per cent of the journey, the mighty Indus river is seen gushing downstream, and on most occasions, only a few feet away from the road. The changing topography is also something one can't help but admire. Mountains of innumerable shapes and sizes dot the landscape enroute to Hanle and their colours ranging from brown to purple makes you believe that mother nature lavished her choicest paint brushes in this region. Dr Amrish Tayal and his wife Priti were particularly awestruck by the scenery that unfolded in front of them. "We can't believe how beautiful this place is", said the doctor. 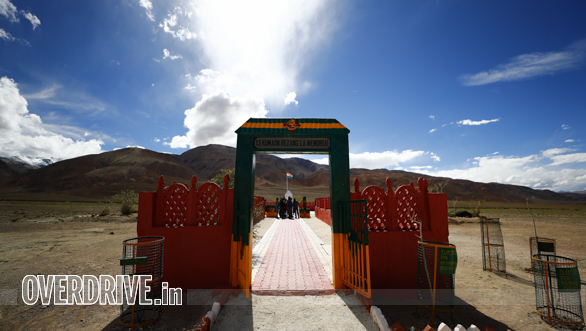 Hanle as a destination, is other worldly. It has this incredible ability to soothe the city-weary soul of a traveler. 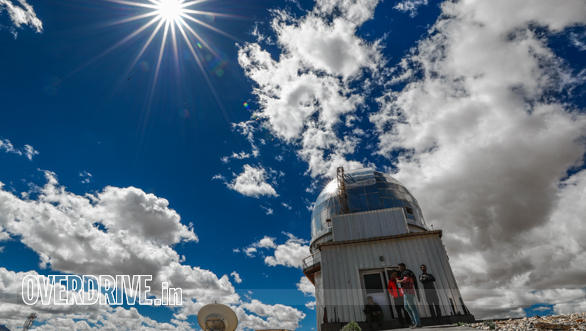 It is also home to the second highest astronomical observatory in the world. That's because it has the most clear night sky for nearly the whole year. That night, huddled in our respective hoodies, jackets and blankets, we stood on the terrace of our beautiful, little lodge and stared at the magnificence of the cosmos above. 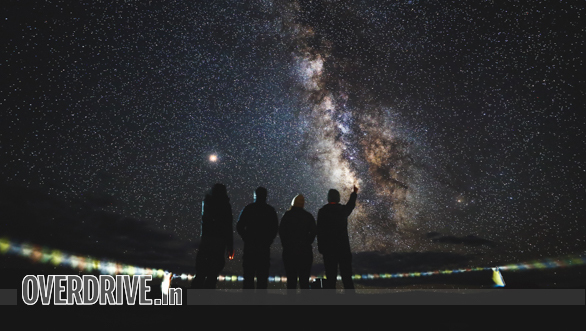 Time almost stood still as everyone gawked at the Milky Way, which was clearly visible interspersed with a dazzling display of shooting stars! Many wishes were made that night. And for some of our participants, the IQD was a dream come true. There could be no better place then to celebrate our nation's 72nd Independence Day. On the morning of August 15, we gathered next to the giant trusses that'll support a huge new telescope. It was quite heartwarming to see the participants scramble to assemble the flagpole. The excitement in the air was indeed palpable. 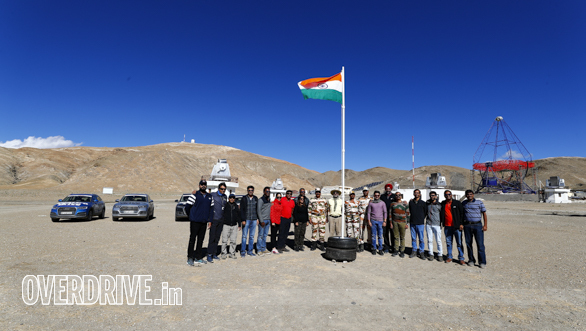 A few minutes later, we were joined by senior Indo-Tibetan Border Police (ITBP) officials. Our hearts swelled with pride as we hoisted our national flag and sung the national anthem with raised voices and chests bursting with national pride, with the very people who protect us. For us, there couldn't have been a greater honour and it was evident in the cheers that followed along with tight hugs. We were all one in that moment. 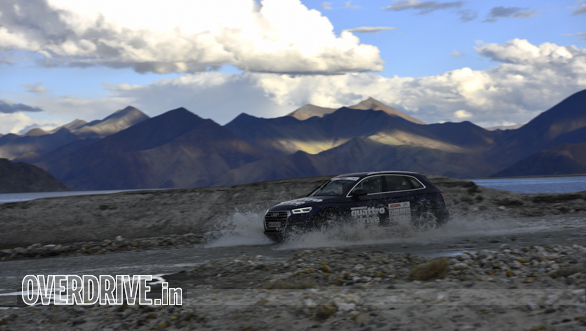 After a quick visit to the observatory we set course for Pangong Tso via Chushul. The road up to Loma was spectacular but after turning right at the check post, the route was basically a mud path, littered with rocks. Cocooned in the luxury and comfort of our Audis we sailed towards our destination. On the way, we stopped at the Rezang La War memorial to pay our respects to the martyrs of the 13th Kumaon regiment who paid the ultimate price during the 1962 war against the Chinese. This battle has gone down in the history books as one of the toughest of all times. Our participants were given the honour of laying a wreath we made ourselves at the memorial. The swell of emotions was hard to contain as we came to terms with the life of our soldiers and their selfless sacrifice for us all. They live away from their families, in challenging weather conditions, braving the chilling breeze and sub-zero temperatures. Their lives are constantly in danger. But they go about their job with hearts filled with love for their nation. To protect and serve people like you and me. Hearts filled with respect for these brave souls, we continued our journey. 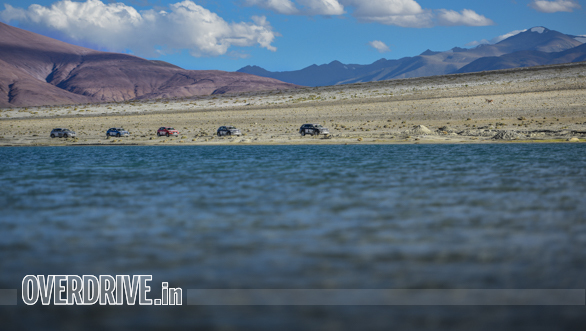 Pangong Tso is mystical and nothing in the world can prepare you for its sight. The azure waters of the lake contrasts against the brown mountains with snow capped peaks. It's magnificent. And the calm that envelops you as you drive along the lake is unparalleled. It was the perfect setting as we dialled the pace down and looked back at another, epic Live Life in OVERDRIVE expedition. While old friends grew deeper bonds there were some who forged new friendships. And the celebration of the freedom we enjoy is what made this Independence Day, truly special.